Details of his life and work including pictures, stop lists and individual organ histories as well as information on those builders who were influenced by Tannenberg's work. For a list of the updates to the site, click here. In the southeastern quarter of Pennsylvania there exists remnants of an organ culture that shares many characteristics with the early organ culture of the region in Germany between Thuringia and Dresden. This was in and near the area where the Bach family lived and worked. This organ-building style was brought to Pennsylvania from Germany by Johann Gottlob Clemm. Clemm had been trained as an organ-builder in the Dresden area and was sympathetic to the Moravians, many of whom had immigrated to Pennsylvania in order to escape the religious persecution they were experiencing in their native Moravia. Clemm arrived in Pennsylvania in 1733 and immediately began constructing organs for Moravian chapels as well as for Lutheran churches. No complete opus list of his instruments has survived but he is known to have constructed several instruments beginning around 1738. From 1758, Tannenberg trained with Clemm until the latter's death in 1762. From 1765 until his death in 1804, Tannenberg was responsible for the building of over forty organs; most for churches in Pennsylvania but a few for churches as far away as Albany, New York, Frederick, Maryland and Salem, North Carolina. Throughout his career, Tannenberg was highly regarded as an organ builder and was in high demand in the German-speaking communities to provide organs for their churches. His organs were the largest and most complete in all of America at the time. 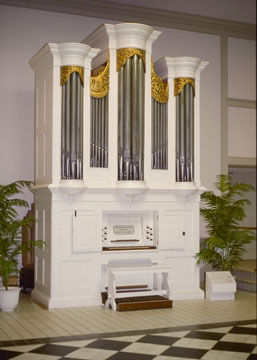 By 1830, many Moravian, Lutheran and German Reformed churches contained organs made by Tannenberg or one of the other Pennsylvania-German organ builders thus creating a German organ culture unique in America. Today, David Tannenberg is widely regarded as one of America's greatest organ builders. His work is comparable to that of some of the greatest organ builders of that time in Europe. Although only nine of his organs have remained for us to examine and to play, his special lieblich style has survived in these instruments for us to enjoy. As of this writing, seven of the nine organs have either remained in or have been restored to their original condition. Another organ has been partially restored. Tannenberg's organs have been played in the conventions of the Organ Historical Society, for various music symposiums as well as for many organ recitals. There is a compact disc series devoted to the Pennsylvania-German organs and all nine of Tannenberg's organs will be featured on these recordings.